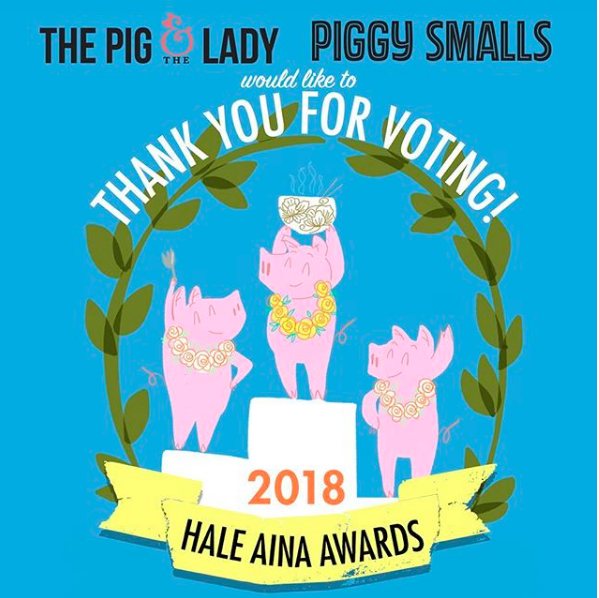 This past Sunday night at the Hale Aina Awards, we were humbled to win several awards including Gold for Best Oahu Restaurant for the second year in a row! In addition, our second locations, Piggy Smalls, won Silver for Best New Restaurant. All in all, we won a total of 6 awards. The other awards were: Silver for Best Business Lunch, Silver for Best Cocktail, Gold for Best Vietnamese and Top Write-In for Best Catering! The competition was tough, but it just goes to show the expansion of Hawaii's culinary scene is stronger than ever. The Hale Ainas are a constant reminder for us to always excel in what we do. It's good to keep us on our toes. We want to thank our patrons for voting for us. We do it all for you! Another quick reminder that we recently started serving Weekend Brunch at Piggy Smalls. Have you seen our various videos promoting this new menu? Spearheaded by our very own founder Chef Andrew, the brunch, which is served on Saturdays and Sundays from 10:00am - 3pm every weekend, has been a big hit! Knowing Chef, the menu will be malleable and refreshed quite often so come by to check out the new dishes he will be serving for brunch! As always, you can view the schedule and the full menu over at the Farmers Market page.